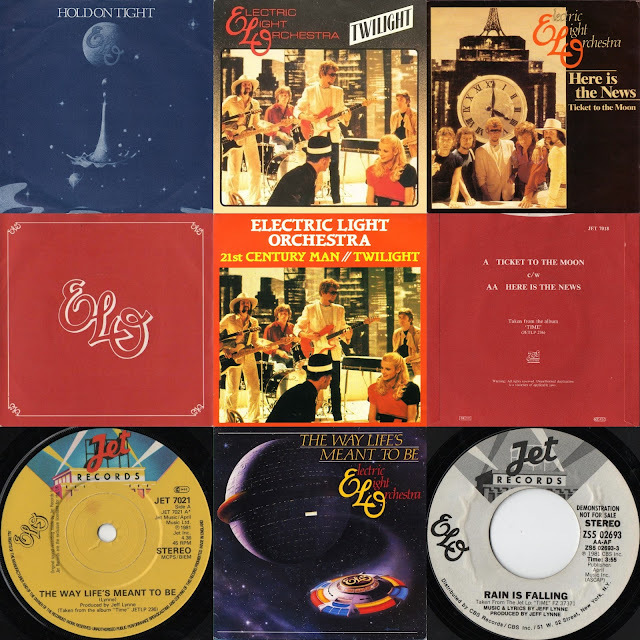 When "Twilight" b/w "Julie Don't Live Here" (JET7015) - the second single taken from ELO's classic album "Time" (JETLP236) - stalled at a modest #30 in the Official UK Singles Chart following the stellar success of lead single "Hold On Tight" b/w "When Time Stood Still" (JET7011), which had peaked at an impressive #4 in September 1981, it was a surprise if not a major disappointment to many fans of the band. Yet, with the third AA sided single "Ticket To The Moon" c/w "Here Is The News" (JET7018) peaking at #24 before fourth single "The Way Life's Meant To Be" b/w "Wishing" (JET7021) failed to chart, the writing seemed to be on the wall for a group whose previous twenty (20) UK singles going back to "Strange Magic" (JET779) in July 1976 had all made the UK Top 40. Yours Truly KJS has often pondered (with the benefit of hindsight) if there had been a different choice or even order of singles issued from "Time " (after "Hold On Tight") whether their chart performance would have fared better. I say this as over in France, "21st Century Man" was paired with "Twilight" (JET808) and perhaps this was a more inspired selection following the up tempo aforementioned lead single rather than "Twilight" as an 'A' side alone. Undoubtedly the inclusion of the unreleased "Julie Don't Live Here" was also attractive to the ELO fan base, but one wonders if, following the death of John Lennon in December 1980 and the tribute dedicated to him during the ensuing 1981/82 "Time" tour plus the fact that "21st Century Man" was of slower pace in contrast to "Hold On Tight" - whether a potential #1 single opportunity was missed. Note also that the relatively sedate "Rain Is Falling" b/w "Another Heart Breaks" (ZS9 02693) was the choice of third single in the US as opposed to "Ticket To The Moon" and "Here Is The News". This is, of course, all conjecture and theory yet "21st Century Man" remains the greatest ELO single never released (except, of course, in France!) - at least in the opinion of this writer. See also: CONCEPT THEORY: TIME AS A 2LP TOO? I think "Julie Don't Live Here" could have stood alone as a single. It's a fantastic song. I think "Julie Don't Live Here" could have stood alone as a single. Great song, as is "Danger Ahead".